We get it, the pool is as important as your room. It's where you can chill out, cool off and make a couple of new friends. Doze on a day bed, party in a cabana or enjoy some new beats with your toes submerged. You crave craft drinks as good as the ones inside and fresh bites that don't skimp on flavor just because you're by the pool. We've got you. Our pool oasis has three pools, a heated hot tub, two bars and plenty of comfy spots for lounging. Palms sway overhead and striped mint umbrellas bring the shade. 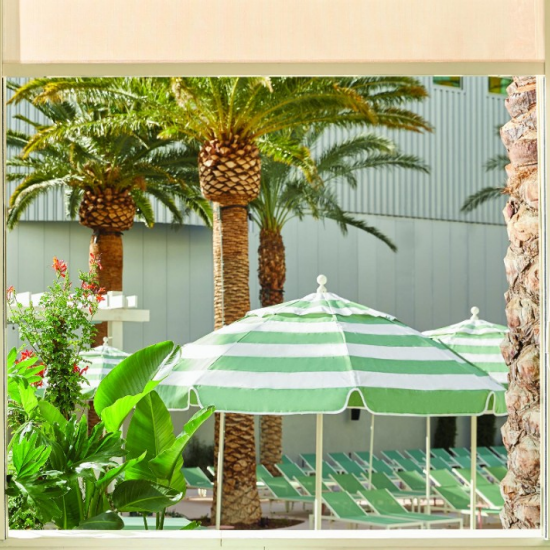 Poolside service will have a Frosé or Park Punch in your hand in no time. Nosh on a Tuna Poke Bowl or Watermelon & Arugula Salad or go all in on the Fajita Chicken Nachos and a bucket of craft beer. 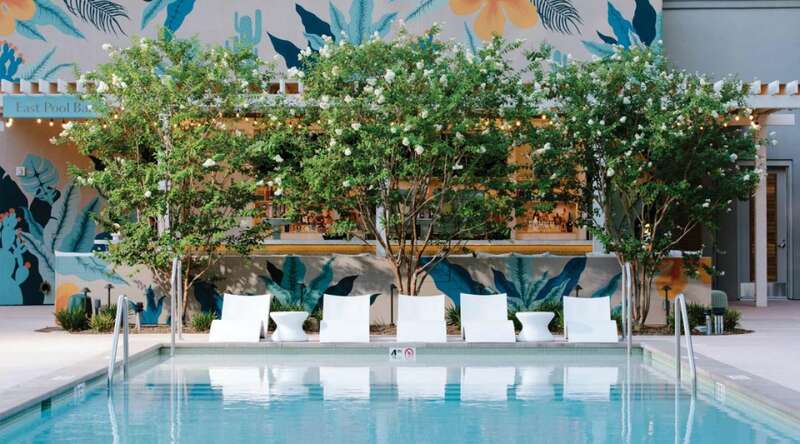 Reserved seating is available, with extra perks, and when you're looking for a little more room and shade for two (or even three), we've got daybeds in prime positions by the pool. Baja Ledge Chairs let you lie back and enjoy both the water and the sun, and booking one of our 12 cabanas is like holding court in your very own VIP clubhouse. Rolling deep? The Park Bungalow is our amped-up version of a cabana, with exclusive amenities and space for up to 20. That's our story. Can we be a part of yours? Reserve an extra-soft lounger for a seat right beside the pools. When you're looking for a little extra shade, our poolside daybed has a flexible canopy and seating for up to 3. Host up to 10 friends, old or new. Cabanas come with their own living space and reserved lounge chairs, plus a dedicated server for when your Margarita refill can't come soon enough. An upgraded version of your favorite pool float, each Baja Ledge Chair sits half in the sun and half in the pool. A hideaway for up to 20, the Park bungalow has pretty much all of the amenities of a suite (except, of course, for a bed.) But if it's a nap in the sun you're looking for, it comes with 6 chaise lounge chairs and 2 umbrellas for that, too. Walk into the resort and pass through the lobby. Make a left as you pass through Primrose and guest services and then walk straight. The pool is located straight ahead. Walk straight pass Primrose and guest services and then make a left. The pool is located straight ahead.